JKCET Application Form 2019: JKCET stands for Jammu & Kashmir Common Entrance Test. This test is regulated by Jammu & Kashmir Board of Professional Entrance Examination (JKBOPEE) for candidates wishing to take admission for BE/BTech course. Every year thousands of applicants Apply Online for JKCET to get admission in government and non-government engineering colleges of J&K state. JKCET exam is held only in Jammu & Srinagar cities. JKCET is engineering entrance exam conducted only for candidates who lives in J&K permanently. 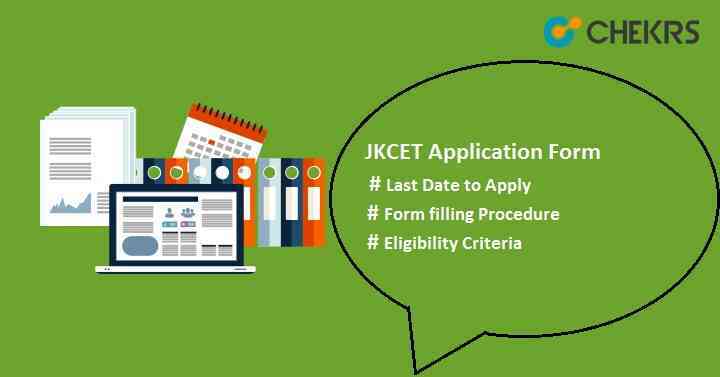 Here we are sharing all basic details about JK CET Jammu application form, eligibility criteria, exam schedules etc. Applicants must have Jammu & Kashmir Domicile. Candidates who have registered themselves under TFW or P&B category are open merit candidates. They must fulfill the eligibility criteria for open merit candidates. Students appeared or will appear in class 12/equivalent examination can apply. Candidates must have scored minimum 50% aggregate in 12th or equivalent examination. He/she must have Physics, Chemistry & Mathematics as compulsory subjects in class 12. Keep all the necessary documents before you fill the online application form. Click on “click here to fill application”. Fill the all required details like personal details, educational details, contact etc. Upload the scanned images of photograph, signature and left-hand thumb impression of given format. Recent-colored photograph without spectacles/caps/hats should be uploaded. Signature should be sign on white paper with Black ink/jel pen. Thumb impression has to be put on white paper with Blue/ Black stamp pad. Submit the application form. After submission, application number will generate and sent to you by Email or SMS on the registered Mail ID or Mobile no. Note down the application no for future use. Next process is to pay the examination fee. Login into the account with generated application no and date of birth. Pay the fee through payment gateway such as Credit Card/ Debit Card/ Net Banking. Enter all bank details and then click on “Pay Now”. After payment, a pop-up will show on the screen of successful transaction. The scanner should be set to scan at 150 dpi (dots per inch). The scanner should be set to a page size of 8 1/2” x 11”. The scanner must be set to scan in black and white. The maximum file size for pdf format should be 200 KB.